Israel’s confirmation that it was behind the 2007 air strike that destroyed the Syrian nuclear facility is no doubt intended as a warning to Iran. However, we suspect that it will sound very unconvincing to Tehran. Much has changed since Israel struck the nuclear site in Deir al-Zor. Making it extremely unlikely that Israel could achieve the same walkover success with Iran’s nuclear facilities as it did with Syria’s. For a start, Iran has a number of key nuclear facilities, some of which are buried deep underground, necessitating the need for more than one strike and the use of specialised bunker busters. Add to this the fact that Syria is far closer to Israel than Iran and in-flight refuelling becomes another hurdle for Israel to overcome. Another formidable obstacle would be Iran’s air defences, which have developed considerably in recent years. Together with its radars, including its long-range over the horizon radars, which could rob Israel of the vital element of surprise. But perhaps the biggest deterrent to Israeli air strikes are Iran’s missiles, which would be used in retaliation against the Jewish state. Israel knows moreover, that despite its vaunted Iron Dome it would not be able to intercept all incoming Iranian missiles. Some, at least would get through, if only because of the sheer number of missiles fired. All of which amounts to a gamble too big for Israel to take on alone. It would need massive U.S. assistance if it were to be successful and given Trump’s increasingly hawkish approach that might be forthcoming in the not too distant future. However US involvement, maybe even taking the lead, would change things dramatically. Transforming a serious but still limited regional clash into a potential global conflict with the possibility that Russia would step in on Iran’s behalf. Again, this can’t be entirely dismissed especially with the West’s increasingly confrontational approach to Russia. Ed. Israel’s confirmation Wednesday that it was behind the 2007 bombing of a suspected Syrian nuclear facility had a specific intended audience: longstanding enemy Iran. 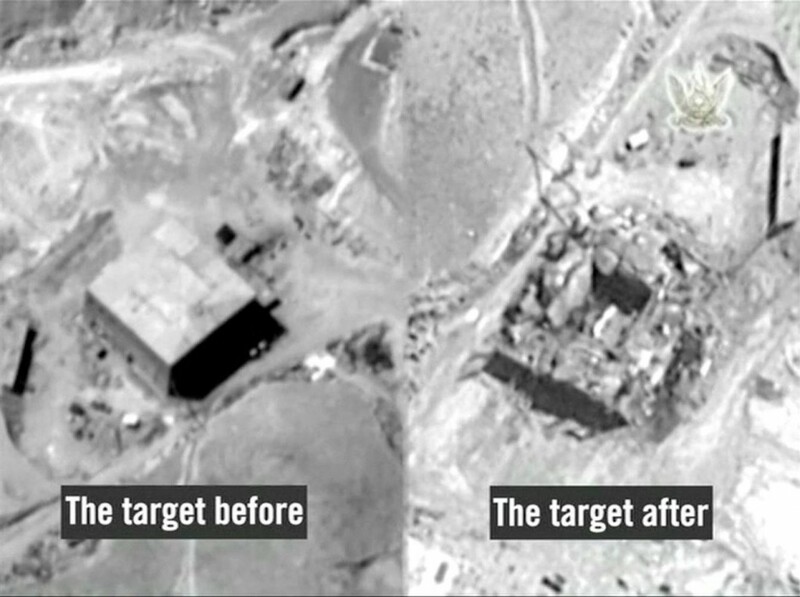 The airstrike on the al-Kabur site in Deir al-Zor destroyed what was believed to be a nuclear reactor, and had been one of the most secretive Israeli military operations in recent memory. Although Israel was widely believed to have been behind the Sept. 6, 2007, strike, it has never before commented publicly on it. Israel is deeply alarmed by Iran’s growing regional power and ambitions. Tehran is allied with the government of President Bashar al-Assad in the civil war in Syria— also a longstanding enemy of Israel. Sunni powers in the region, such as Saudi Arabia and the United Arab Emirates, are also deeply suspicious of Iran’s nuclear ambitions, which they claim have not been curbed by a landmark 2015 international agreement that saw some international sanctions lifted. Israeli Defense Minister Avigdor Lieberman underlined intelligence minister Katz’s statement. In a lengthy release, the Israeli military said that eight F-15 fighter jets carried out the top-secret airstrikes against the facility about 300 miles northeast of Damascus, and destroyed a site that had been in development for years and was scheduled to go into operation at the end of 2007. Israel and Syria were bitter enemies before the Syrian civil war broke out in 2011. Since the conflict erupted, Israel has carried out well over 100 airstrikes, most believed to have been aimed at suspected weapons shipments destined for the Iranian-backed Lebanese militia, Hezbollah. President Donald Trump, who has forged closer ties with longstanding American ally Saudi Arabia, has long promised to scrap the agreement with Iran that saw Tehran curtail its nuclear ambition in exchange for a lifting of punishing economic sanctions. In Iran, where the country was celebrating New Year, there was no immediate reaction to Israel’s announcement.